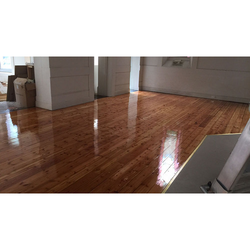 We are offeringWooden Flooring Services. We wish to introduce ourselves " Famous Furniture & Interior Contractrors ", Inception in 1998 a premier organization, having its wings spread out across India. We have been associated with the furniture industry for the past two decades. The expertise has been in the core business of manufacturing Designer and Workstation Furnitures like as School and Institutional Furniture, Exclusive Office Cabin Furniture, Workstation Furniture & Many more. Basically a One Stop Interior Solution arrangement in interiors, by understanding patiently the customer requirements and his varied needs. Our rich experience has been delivering quality products, ensuring absolute customer satisfaction which has helped us to achieve a leadership position. We have been able to capitalize as one of the market leaders in short span of time. We also wish to state that we do have State of Art fully integrated modern hi-tech manufacturing plant, with all CNC machines installed in our plants located in Pune And Mumbai, to cater to the needs of the customer from any of the 2 factories. The outcome of this initiative will be the capacity to manufacture large bulk volume of quality products using the latest sophisticated machineries adopting the most modern manufacturing processes. We take the pleasure of inviting you to our most modern plant which will give you clear picture of our capacity to produce quality material. Our products salient features have been to give contemporary furniture, ergonomically designed, versatile, functional, low maintenance, cost effective befitting every individual with proper value engineering & absolute user friendly. While thanking you for giving us an opportunity to introduce ourselves, we assure you of our best services always. Today, the way your work spaces are designed and executed, play a key role in the overall productivity and attitude of the organization. We at Bhavik pay attention to every small detail, ensuring you give your team nothing but the very best in work environment.